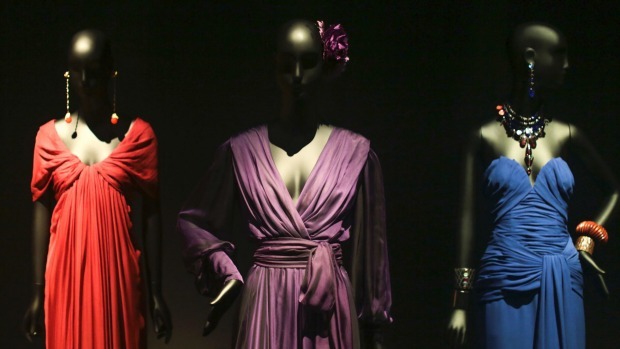 The Yves Saint Laurent museum has opened its doors to the public in Marrakech, the sunny, bustling, gritty Moroccan city beloved by the late French designer. The Marrakech museum, designed by the French architectural firm Studio KO, sprawls across 4,000 square meters near the Majorelle Garden, which Yves Saint Laurent and his late partner Pierre Berge bought in 1980. The museum was inaugurated on October 14 by the wife of Moroccan King Mohammed VI, Lalla Salma, alongside actresses Catherine Deneuve and Marisa Berenson. "This project finds its genesis in the temporary exhibition organized in the Majorelle Garden, which was called 'Yves Saint Laurent and Morocco,"' explained Museum Director Bjorn Dahlstrom. "(That) exhibition was so enthusiastically welcomed that Berge decided to create here, in Marrakech, a museum dedicated to Yves Saint Laurent." At the entrance to the museum, visitors bought tickets on Thursday next to a red facade of Tetuan brick and granite, which Dahlstrom said "fits perfectly in the urban environment of Marrakech." Berge, who died earlier this year and was also Saint Laurent's business partner, "often came to the construction site to see its progress," said Sanaa El Younsi, a member of the museum team. "What a pity he's not here to attend the opening." The Majorelle Garden, next to the museum, has a special significance for Saint Laurent, who would often design his collections in the dappled shade of the city's terracotta buildings with the scent of flowers in the air. Today, the Majorelle Garden is one of the most visited tourist sites in the city. Saint Laurent would come here "as soon as "he finished a collection, to rest and prepare a new collection" said Majorelle Garden Foundation head Quito Fierro. "The garden was closed to the public between 12.30pm and 2.30pm to allow Yves Saint Laurent to walk without meeting people," he remembered. "Almost all the collections were drawn on a white sheet in Marrakech."